Of the numerous essential oils out there, dōTERRA’s On Guard blend is definitely one of my favorites. Not only is it formulated to help us stay healthy during cold and flu season, it also has a warm and spicy aroma that lends itself perfectly to the holidays while being invigorating and uplifting. This blend uses essential oils known for their ability to support healthy immune system function in order to protect us against environmental threats. These oils have been studied for their abilities to kill harmful bacteria, mold, and viruses. dōTERRA On Guard can be used on surfaces at home as a non-toxic cleaner, as well as be diffused into the air to help cleanse and purify your home. Ingredients: Wild Orange Peel, Clove Bud, Cinnamon Bark, Eucalyptus, and Rosemary essential oils. Certified 100% pure. – Energizing and uplifting aroma. – Topical use: Massage 1-2 drops to throat, stomach and bottoms of feet. It can also be massaged over the Thymus to stimulate the immune system (right below where your collarbones meet), and the underarms to stimulate the lymphatic system. If skin sensitivity is noted, you can dilute the essential oil with a carrier oil (such as fractionated coconut oil). 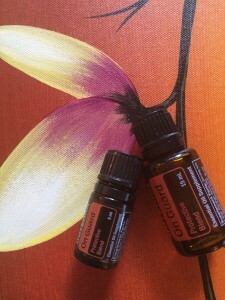 – Diffusion: Use 3-6 drops in a diffuser. – Internal: Dilute1 drop in 4-8 ounces of water. **Note: Not all essential oils can be taken internally. Only essential oils that are Certified Pure Therapeutic Grade (CPTG) and are marketed for internal use should be ingested.